On Sunday night a plane loaded with Oxfam aid for Sudanese refugee camps will fly from Kent to an airstrip in the Darfur region. 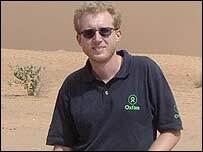 Oxfam's Adrian McIntyre is based in Darfur. He tells BBC News Online of the difficulties of getting aid to those who most need it. Most of the water and sanitation equipment on this flight will go to Kalma, a camp located 15 km east of Nyala, the capital of South Darfur, where the plane is due to land. There's been a huge influx of displaced people to Kalma camp in the past few weeks, and the population has swelled to nearly 60,000. Oxfam teams will use this equipment to provide clean water and proper sanitation facilities in the camp. 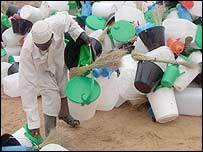 These measures are absolutely essential to prevent the spread of diseases such as cholera and typhoid. Many other ailments are linked to contaminated water and unhygienic conditions, including diarrhoea and acute respiratory infections. For people in a fragile state of health, compounded by malnutrition, these diseases can be fatal - especially among children. Three months after the cease-fire in Darfur, fighting and insecurity still plague the region. Travelling by road is risky. There are frequent reports of commercial lorries and aid convoys being ambushed and looted by armed bandits. Oxfam takes careful precautions to maintain the safety of its staff, but this generalised insecurity often hampers our work. Oxfam staff have not been affected in any such incidents but we have cancelled or postponed numerous trips due to reports of violence on the roads we were planning to take. We do not use armed protection, but rather work very hard to gain acceptance by the communities in which we work. Our commitment to the humanitarian principles of impartiality and independence helps us gain people's trust - a key factor in ensuring the safety of our staff. We also have strict security management procedures in place. We actively gather as much information as we can about the security situation in the areas where we travel and work. This involves sharing information with other aid agencies and with UN agencies. We only travel in convoys of two vehicles or more, and all of our vehicles are clearly marked with Oxfam logos and flying Oxfam flags. Good communications are essential as well, and we use satellite phones along with HF and VHF radios to maintain regular contact when we are out in the field. The government of Sudan has taken some important steps toward providing free and unhindered access for humanitarian aid to Darfur. It has removed travel restrictions for aid workers and lifted customs duties for humanitarian supplies. But flooding is still a problem. The road from Nyala to Kalma is a rutted dirt track through semi-arid, undulating plains punctuated by a few rugged hills. The distance is only 15km, but the journey takes at least an hour when the weather is good. It's been two days since the last rain, which means that the road is passable at the moment. There are still some large pools of water in the deep gullies that cut across the road, but our Land Rovers and heavy-duty lorries can manage to get through them. But when it rains, it really pours, and the road becomes extremely difficult to negotiate. Drainage is very poor, and the whole place can turn to a swamp in minutes. Vehicles end up going off-track to work their way around the most flooded areas.